Emergency calls for services such as fire, ambulance, coastguard etc call the emergency services number. The messages are routed to regional dispatch centres. The dispatch systems automatically send messages to local fire, ambulance and coastguard stations, where emergency vehicles are dispatched. The customer needed to upgrade their infrastructure to support resilient IP VPN while still supporting legacy terminals and maintaining high SLAs with corresponding reporting and monitoring. The customer also required an audit trail function that recorded transactions sent and received. These would be reviewed where there was a failure or delay in responding to an incident to determine if the fault was due to network issues. The Virtual Access solution avoids a single point of communications failure by providing dual path DSL/3G communications. The 3G radio, AC PSU and serial to IP converter are integrated in the Virtual Access router, meaning that there is a single device to deploy on site which avoids the need for an external 3G dongle, AC PSU or serial converter; thereby increasing the resilience and simplicity of deployment. 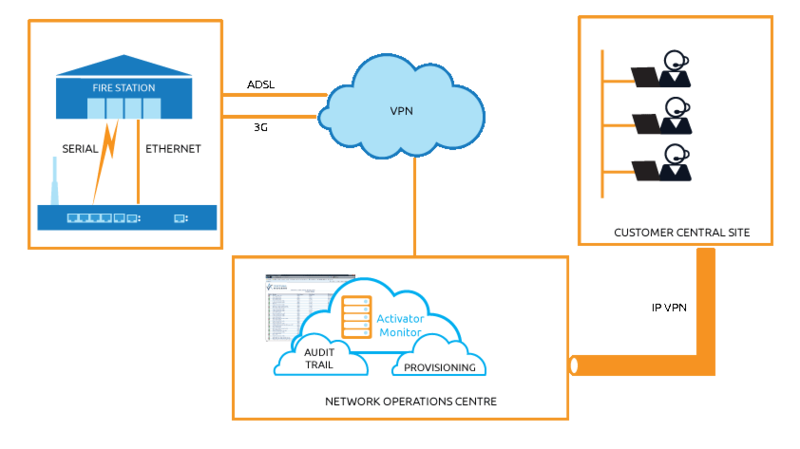 Activator was used to automatically provision the routers and OSS integrator enabled seamless integration with deployment, logistics, billing and monitoring systems. The devices connected to a Virtual Access AOS which provided the audit trailing function for logging of historical transactions.